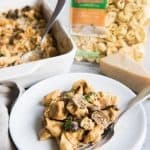 This Cheesy Tortellini & Chicken Pumpkin Alfredo Bake features Buitoni® Three Cheese Tortellini with pan-seared chicken breast, tossed with a cheesy, creamy pumpkin alfredo sauce, as well as fresh mushrooms and crumbled bacon! It's a family-pleasing weeknight meal that is savory and satisfying! Prepare tortellini according to package directions in a large pot of boiling, salted water. Drain and set aside. Cook the bacon in a large skillet until crispy. Remove with a slotted spoon and keep warm. Drain the grease from the bacon and wipe out the skillet. In the same skillet used for the bacon, heat 2 tablespoons of olive oil over medium-high heat. Season the chicken breasts with salt & pepper, then grill in the skillet until nicely browned on the outside and cooked through, about 3-4 minutes per side. Remove from the pan and allow the chicken to rest before cutting into bite-size pieces. Keep warm. Using the same large skillet used to cook the bacon and chicken, melt the butter over medium heat, then add the garlic and cook and stir for 30 seconds, just until fragrant. Add the mushrooms and cook for 3-4 minutes, just until softened. In a separate bowl, whisk together the pumpkin puree, chicken broth, milk and flour. Add to the garlic and mushrooms and continue to cook, stirring frequently, until hot and bubbling, about 5 minutes. Add the cream cheese cheese and whisk until melted. Stir in the half of the Parmesan, Romano and Mozzarella cheeses and season with salt and pepper. Reserve the remaining cheese for topping the casserole. Reduce heat, and allow the sauce to simmer for 5 minutes, until slightly thickened, then add the tortellini to the sauce and toss to combine. Transfer to a baking dish and top with remaining cheese. Bake at 375 degrees for 13-15 minutes, until cheese is melted and dish is hot all the way through. Sprinkle with fresh chopped parsley and toasted pine nuts, if desired.